What Quote Roller Triggers and Actions are Supported? New Proposal Comment - Triggers when a new comment is added to a proposal. New Company - Triggers when a new company is added! New Tax - Triggers when a new tax is added! New Contact - Triggers whenever you add a new contact! New Template - Triggers when a new template is created! New Proposal - Triggers when a new proposal is created! Create Product - Create a product that can be used in proposals. Create Proposal - Creates a new proposal! 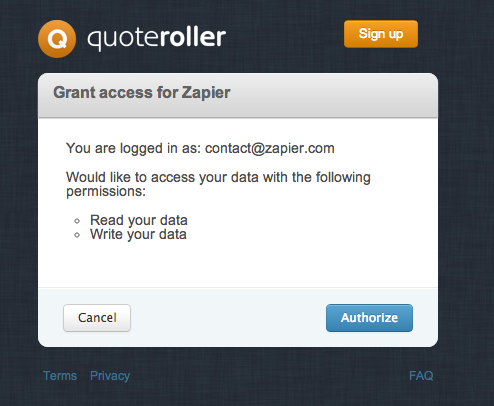 In order to get Started with using Quote Roller you'll need both a Quote Roller and Zapier Account. First up, you'll need to select Quote Roller as the integration you want to use on the trigger or action side. When the time is right, you'll be asked to connect a Quote Roller account. You will then be asked to give a name for this account (as you can use multiple accounts). Once you've done this click "Continue". You will then be directed to Quote Roller's site and asked to authorize Zapier to be able to access your data on your behalf. Once you've clicked Authorize you'll be returned to Zapier and should have a successfully tested authentication added. Now you're ready to start using Quote Roller with Zapier!